A new year means it is once again time for the most exciting part of the NFL season -- the playoffs. At the beginning of the 2012 season, as always, we had some favorites that were practically shoo-ins to reach the postseason, such as the 49ers, Packers, and Patriots, who indeed fulfilled their expectations. But we also have the Vikings, Redskins, and Colts, who came off terrible seasons and managed to turn things around incredibly fast to make an unexpected playoff appearance this year. While some teams earned a bye week and are automatically in the second round, regular season records go out the window at this point. Sure, home field plays a vital role in a team's chances to make a strong playoff push, but it doesn't always equal wins. In fact, a 5th or 6th seed has won 3 of the last 7 Super Bowl titles. Just last year, the Giants set an NFL record for the worst regular season record (9-7, .563 win percentage) by a Super Bowl champion, and only once since Super Bowl XXVIII in 1994 has both #1 seeds made it all the way to the championship game. As you can see, it is not always the top-seeded teams that end up going all the way. It's all about getting hot at the right time. Anything can happen. For these reasons, it is quite difficult to predict a perfect postseason bracket. With that said, here are my 2013 playoff predictions. It won't be a blowout like last year's wild card match up between these two. The only chance Cincinnati has at beating Houston is through the air. The Texans secondary has been suspect all year long. The problem is that Andy Dalton has not been playing so well as of late. He will keep his team close, but I don't think he can carry the Bengals to victory this Saturday. I expect another big game from Arian Foster which will help control the clock and edge out a tight game. This looks to be an exciting, hard fought game. Indy's defense is the key to this one. They were the 29th-ranked defense, so they'll have to play better than that if they want a shot at the upset. Andrew Luck, as impressive as he has been for a rookie, will have a couple key turnovers and Ray Rice will dominate for Baltimore. I don't see this game being a nail biter like their Week 17 match up was. The Packers are extremely tough to beat at Lambeau Field and the Vikings are not as great on the road as they are at home. Adrian Peterson will have his way with Green Bay once again, but the Minnesota offense just isn't balanced enough to keep up. Most people are choosing this game as the one where the wild card team advances over the division winner. I'm not one of them. These are two of the hottest teams in the NFL right now. Seattle is on a 5-game winning streak, while Washington has won their last 7. The Seahawks are a completely different team away from CenturyLink Field where they were a perfect 8-0 this season. They're only 3-5 without their "12th Man," though. The Skins' 5th-ranked rush defense will contain Marshawn Lynch, and despite not being at 100%, RG3 will make enough plays to get his first career playoff win. I predict a similar result to the thrashing the Broncos gave the Ravens in Week 15. Denver is riding an 11-game winning streak and has been clicking on all cylinders. Baltimore's injury riddled defense stands no chance against this Peyton Manning-led offense. The Ravens will fall behind early and get away from using their best offensive weapon, which is Rice. The last time these two met in Foxborough, it wasn't pretty. I'll give the Texans the benefit of the doubt and say they won't get demolished 42-14 again. Foster will have a better game this time and allow Schaub to play-action more successfully. It won't be enough against Tom Brady & Company, though. Ol' No. 12 will shred Houston's secondary once more. The Falcons got off to a hot 11-1 start, but have since dropped 2 of their last 4 games. With the week off, I think it'll be tough for them to get back to elite form. This looked like the year that Matt Ryan finally got over the hump, but unfortunately I think he will have to wait one more year. Atlanta's defense (especially if John Abraham doesn't get healthy) will not be able to stop Alfred Morris and RG3. Their rushing attack will keep Ryan off the field just enough to get the win. In a re-match of Week 1, the 49ers are fortunate enough to be playing at home this time around. Lambeau Field in early September is much different than it is mid-January. While the Packers offensive line has been dismal all season long, I think they will rise to the occasion and give Aaron Rodgers enough time to make some big plays. However, the Niners will take advantage of Green Bay's weak spot -- their defense, and win a shootout. There is really no surprise here. The conference's two best teams (and preseason favorites) will meet once again. Peyton Manning vs. Tom Brady. What better way to decide who wins the AFC this year. Denver's last regular season loss came against New England back in Week 5. The big difference this time around is that the Broncos defense has since stepped it up. This along with the fact that the game will be played at Sports Authority Field at Mile High will prove to be the difference in a close game. Granted, I am going out on a limb by saying the Skins make it this far, but I feel that they are hot enough right now to make a nice run, even with RG3 not at full strength. The D is coming into its own and Morris has made a strong push for Rookie of the Year. Their magical run will come to an end against the potent Niner defense though. After a rusty showing against Green Bay, I think the San Francisco D will get back on track with a stellar performance. 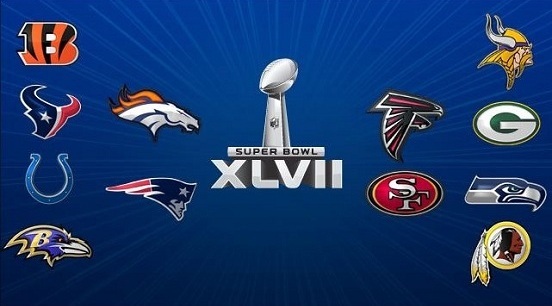 At the start of the season, I had the 49ers and Ravens as my favorites to reach the big game. Unfortunately, we won't witness a Harbaugh Bowl. I still feel that the Niners are the most balanced team in the NFC. Their passing attack might not be as great as the other elite teams, but their running game is still terrific, along with arguably the best D in the league. And the Broncos have looked like the best overall team in football for quite some time now. They obviously have an excellent offense, but their defense and special teams has also been great. With that said, I think Peyton Manning finds ways to outsmart the San Francisco defense and cap off his tremendous comeback season by winning his second ring and Super Bowl MVP. Who do you think will hoist the Lombardi Trophy this year? Seattle kills Washington this weekend. Pretty good picks. I like the Super Bowl prediction the most. Broncos-Falcons in the Super Bowl with the Falcons winning it. Broncos-Packers in the Super Bowl with Denver winning it. Peyton won't be denied this season.